For males worldwide, prostate cancer (PCa) has the second highest incidence of all cancers. Each year, approximately 238,590 new cases and 29,720 deaths are reported according to cancer statistics, 2013. In view of the anfractuous pathogenesis of PCa, interconnected cell signaling pathways and transmissions which manipulates the survival, evolution and apoptosis of cells1-3, would provide us new inspirations of the prevention and treatment of PCa patients. Among diverse pathways, genes encompassed in phosphoinositide 3-kinase (PI3K)/Akt signaling pathway, such as toll-like receptor-4 (TLR4), vascular endothelial growth factor (VEGF), interleukin 6 (IL-6), insulin receptor substrate 1 (IRS1) and insulin-like growth factor 1 (IGF1), appear with more common mutations or amplifications in PCa (Figure S1 and Figure S2). PI3K is a phosphatidylinositol kinase which is encoded by the PIK3CA gene. It consists of a catalytic subunit p110 and regulatory subunit p85. Akt is a cytoplasmic serine-threonine protein kinase which promotes the progression of cell cycle and inhibits cell apoptosis. The PI3K/Akt signaling pathway is implicated in different cellular functions, including survival, growth, proliferation, metabolism and angiogenesis. Currently, the relationships between polymorphisms in genes of PI3K/Akt signaling pathway and PCa risk have been an area of intense investigations but with mixed results4,5. For instance, Balistreri et al.6 pointed out that there existed a significant association between polymorphisms in TRL4 and an increased risk of PCa, a result consistent with both Wang et al. 's7 and Chen et al. 's8 work. However, Shui et al.9 has conducted a case-control study comprising 1,267 controls and 1,286 PCa cases and found that genetic variation across TLR4 alone is not strongly associated with PCa risk. As for polymorphisms in IGF1, Schildkraut et al.10 revealed the significant association between genetic polymorphisms in IGF1 and PCa risk among Black and White men. On the contrary, Neuhausen et al.11 failed to find any positive connection between IGF1 polymorphisms and PCa risk. In addition, for IL-6-rs1800795, both Kesarwani et al.12 and Mandal et al. 's13 studies supported the role of IL-6-rs1800795 polymorphism in PCa, while the result was inconsistent with Bao et al. 's14 work. Hence, previous studies had presented inconsistent views between polymorphisms encompassed in genes of PI3K/Akt signaling pathway and PCa risk. Considering that, we conducted the current updated meta-analysis in order to precisely evaluate their associations on the foundation of all available eligible studies, providing with convincible evidence for the prevention and/or targeted therapy for PCa patients. The gene set of PI3K/Akt pathway was referenced to the Kyoto Encyclopedia of Genes and Genomes (KEGG) website (http://www.kegg.jp/kegg-bin/show_pathway?hsa04151). The gene set was originally provided via the KEGG signaling database, and encompassed the following 101 genes: ANGPT2, ANGPT4, IL2RB, CD19, COL1A, IL3, COL2A, IL3RA, COL4A, COL6A, IL6, COL9A, CSF1, CSF1R, CSF3, CSF3R, EFNA, EGF, EGFR, EPHA2, EPO, EPOR, FGF, FGF1, FGF2, FGFR1, FGFR2, FGFR3, FGFR4, FLT1, FLT4, GH, GHR, IL6R, GRB2, HGF, HRAS, IFNA, IFNAR1, IFNAR2, IFNB, IGF1, IGF1R, IGH, IL2, IL2RA, IL2RG, IL4, IL4R, IL7, IL7R, INS, INSR, IRS1, JAK1, JAK2, JAK3, KDR, KIT, KITLG, KRAS, LAMA1_2, LAMA3_5, LAMA4, LAMB1, LAMB2, LAMB3, LAMB4, LAMC1, LAMC2, MAP2K1, MAP2K2, MAPK1, MAPK2, MAPK3, MET, NGFA, NGFB, NGFR, NRAS, OSM, OSMR, PDGFA, PDGFB, PDGFC_D, PDGFRA, PDGFRB, PGF, PIK3AP1, PRL, PRLR, RAC1, RAF1, SOS, SYK, TEK, TLR2, TLR4, VEGFA, VEGFB and VEGFC-D.
To evaluate the connections between polymorphisms in genes of PI3K/Akt pathway and PCa risk, we conducted the present study by combining all accessible studies together from diverse databases, including Web of Science, PubMed, and China National Knowledge Infrastructure (CNKI) databases. The integrated keywords were: ('genes' OR 'abbreviations of genes') AND ('cancer' OR 'tumor' OR 'carcinoma' OR 'neoplasms') AND ('polymorphism' OR 'mutation' OR 'variant' OR 'SNP' OR 'genotype'). At the same time, we used the integrated keywords (Gene_ID & prostate cancer) to search on Google, and performed the hand screening from all highly connected results. Besides, extra studies were collected via the reference lists of the identified studies. The final date of retrieval was in October 1, 2017. The whole studies in the analysis were firstly published in the primary literature with no reproduction in other studies. The inclusion criteria in this analysis were: (1) the cases were PCa patients and the controls were no history of cancers; 2) cohort studies or case-control studies concerning the relationships between polymorphisms in genes of PI3K/Akt signaling pathway and PCa risk; (3) the raw data of genotype frequency can be extracted. The exclusion criteria were as follows: (1) the raw data were not accessible; (2) case-only studies that didn't have control groups; (3) family-based association studies; and (4) Review papers. All of the data extraction work should be completed independently by 2 of the authors according to the prelisted inclusion criteria. And the arguments should be solved by another expert(s). You didn't mention the procedure in your article. In addition, we extracted data from each case-control study, including genotype frequencies, name of first author; year of publication; ethnicity and number of cases and controls. In addition, we used The Newcastle-Ottawa Scale (NOS) to evaluate the quality of enrolled studies. The meta-analysis was conducted to assess the associations between polymorphisms in genes of PI3K/Akt pathway and PCa risk. Hardy-Weinberg equilibrium (HWE) in the control group was tested15. To make a more comprehensive meta-analysis, five genetic models were adopted, including allele contrast (M vs. W), codominant (MM vs. WW and MW vs. WW), dominant (MM + MW vs. WW) and recessive models (MM vs. MW + WW). The impact of relationship was evaluated by odds ratio (OR) with a corresponding 95% confidential intervals (95%CI). What's more, when the heterogeneity (P > 0.1 as the standard) 16 was assessed, the I2-based Q statistic was used (I2 = 0-25%: no heterogeneity; I2 = 25%-50%: moderate heterogeneity; I2 = 50%-75%: large heterogeneity; I2 = 75%-100%: extreme heterogeneity) 17, which represented the weighted sum of the squared difference between the overall effect size and the effect size from every study. When I2 > 50% or PQ ≤ 0.1, substantial heterogeneity was existed, then, a random-effects model was used; otherwise, the fixed-effects model was be applied. It has been recognized that when results of the component studies differ among themselves, random effects incorporate an estimate of the inter-study variance and provide wider 95%CIs18. The analyses were conducted using Stata 12.0 (Stata Corporation, USA), and all P values were two-tailed. After initial screening, there were 1,166 results related to the search words enrolled. After reading the important information such as the titles and abstracts, 51 potential eligible studies were selected for next step full-text view. When a further screening was conducted, 13 of these studies were excluded for not associated with PCa risk. Finally, 38 articles with 62 case-control studies were left for data extraction (Table 1) 12,19-54. Of them, there were 2,170 cases and 1,587 controls for TLR4-rs1927914 polymorphism (from three studies), 3,842 cases and 3,143 controls for TLR4-rs10759932 polymorphism (from 4 studies), 3,508 cases and 2,960 controls for TLR4-rs2149356 polymorphism (from 4 studies), 1,467 cases and 1,551 controls for TLR4-rs4986790 polymorphism (from 4 studies), 3,985 cases and 3,438 controls for TLR4-rs11536889 polymorphism (from 5 studies), 2,380 cases and 2,357 controls for TLR4-rs7873784 polymorphism (from 3 studies), 632 cases and 685 controls for VEGF-rs833061 polymorphism (from three studies), 1,511 cases and 821 controls for VEGF-rs1570360 polymorphism (from three studies), 1,243 cases and 1,620 controls for IRS1-rs1801278 polymorphism (from four studies), 2,289 cases and 2,114 controls for FGFR4-rs351855 polymorphism (from three studies), 1,805 cases and 3,235 controls for IL-6-rs1800796 polymorphism (from three studies), 10,625 cases and 12,353 controls for IL-6-rs1800795 polymorphism (from eight studies), 2,217 cases and 2,471 controls for IGF1-(CA) 19 polymorphism (from seven studies), respectively. In addition, the study selection processes for these polymorphisms were showed in Figure S3-8. Furthermore, of the 62 case-control studies, 41 sets were performed on Caucasian populations, seven sets on Asian populations, six sets on African populations, and the other eight were based on mixed ethnic groups (including at least one race). Controls of 42 studies were population-based (P-B), while the other 20 studies were hospital-based (H-B). The quality of the enrolled studies was assessed by NOS and presented in Table S1. Results of the association between polymorphisms in genes of PI3K/Akt pathway and PCa risk were showed in Table 2 and Table S2. However, the pooled results suggested negative associations between all the 13 polymorphisms in six genes of PI3K/Akt signaling pathway and PCa risk. However, in the subgroup analysis by ethnicity, we found that IL-6-rs1800795 polymorphism was associated with an increased risk of PCa in dominant model for Caucasian population (MM + MW vs. WW: OR=1.245, 95%CI = 1.176-1.318, P < 0.001, Figure 1A). Furthermore, in the subgroup analysis by source of control, we also found an increased risk of PCa for P-B groups in dominant model (MM + MW vs. WW; OR = 1.246, 95%CI = 1.177-1.319, P < 0.001, Figure 1B). Although subgroup analyses were also conducted for other polymorphisms in genes of PI3K/Akt signaling pathway, negative results were found. Sensitivity analysis was conducted by excluding one single study each time, and no evidence was observed suggesting pooled ORs shift (Table S3). 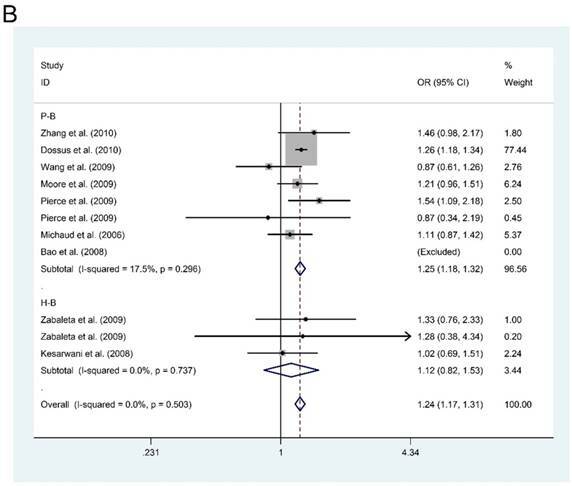 In addition, we used Begg's funnel plot and Egger's regression test to assess potential publication bias. As for TLR4-rs1927914, TLR4-rs10759932, TLR4-rs2149356, TLR4-rs4986790, TLR4-rs11536889, TLR4-rs7873784, VEGF-rs833061, VEGF-rs1570360, IRS1-rs1801278, FGFR4-rs351855, IL-6-rs1800796, IGF1-(CA)19 polymorphisms, no evidence of publication bias was identified by viewing the shape of Begg's funnel plot, which was further validated by Egger's regression test. However, for IL-6-rs1800795 polymorphism, potential publication bias was existed (P = 0.016) (Table S4). In that case, we further conducted sensitivity analysis by using the trim and fill method55, and imputed studies provide a symmetrical funnel plot (data not shown), indicating publication bias was not existed. Characteristics of the enrolled studies. Details of the association between IL-6-rs1800795 polymorphism and prostate cancer risk. Note: Hardy-Weinberg equilibrium (HWE); P-B: population-based; H-B: hospital-based; Y: Studies conformed to HWE; N: studies did not conform to HWE; Mixed: more than two descendant; *P value less than [0.05/ (5*13)] means statistically significant. Forest plots of the association between IL-6-rs1800795 polymorphism and prostate cancer risk. Subgroup analysis by ethnicity (A) and source of control (B). Recently, enormous studies suggested that polymorphisms in genes of PI3K/Akt pathway may play an important role in the prevention, diagnosis and treatment of PCa. For example, TLR4 is the main component of TLRs and has been positively investigated in inflammation and cancer. Previous studies had confirmed that two polymorphisms in TLR4 (rs4986790 and rs4986791) owned susceptibility to various type of cancers, including PCa56. VEGF is the most significant regulator of angiogenesis in human, and it plays a significant role in the occurrence and development of PCa49,50. It had been identified that there were many genetic variants in the VEFG gene57, but the conclusions were remained inconsistent23,52-57. The IRS1 gene Gly972Arg (rs1801278) polymorphisms had been found a significant association with increased cancer risk58. In vitro studies have proved that the IRS1 gene rs1801278 polymorphism impaired insulin-stimulated signaling pathway, especially through the PI3-kinase pathway59. What's more, as a docking protein for the insulin-like growth factor receptor 1 (IGF1R) 60,61, IRS1 controls IGF-1 mediated cell growth and survival60. Thus the polymorphisms of IGF-1 gene also related to the cancer risks including PCa61. Fibroblast growth factor receptor 4 (FGFR4) is one member of the family of fibroblast growth factor receptors (FGFR1-4), which displays complicated biological activities such as angiogenic and mitogenic activity. Previous study had presented that its gene polymorphism was related to PCa risks62. The human IL-6 gene encodes IL-6, a cytokine which adjusts the level of inflammation. Two polymorphisms on the promoter region of IL-6, rs1800795 (-174G/C) and rs1800796 (-572C/G) have been identified to be associated with IL-6 production63. 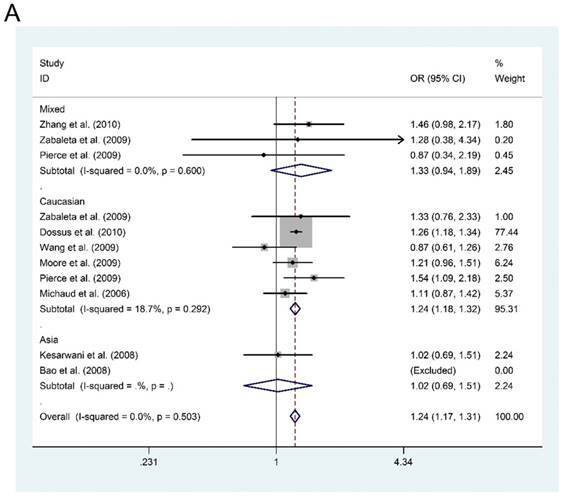 And these association with risks of cancer have been published in a previous meta-analysis64,65. Furthermore, although these studies and meta-analysis provided some clues for separate polymorphisms in one or more genes of PI3K/Akt pathway and PCa risk, these results were not fully consistent, or even contradictory at sometimes. Therefore, we performed current meta-analysis in order to provide a comprehensive accurate assessment of the associations of these polymorphisms in genes of PI3K/Akt pathway with PCa risk. To the best of our knowledge, this is the first pooled study that analyzed the associations between 13 polymorphisms in six pivotal genes of PI3K/Akt pathway and PCa risk. Meanwhile, further analyses were conducted in different subgroups to explore the potential associations or heterogeneity sources. Nevertheless, overall results revealed that none of these polymorphisms was associated with PCa risk. Then, we performed subgroup analysis based on ethnicity, source of control (population-based or hospital-based) and HWE status (conform or not conform). For IL-6-rs1800795 polymorphism, when the stratification analysis was conducted by ethnicity, we found that a statistically significant increased risk of PCa was identified in the dominant model for Caucasians. However, in the meta-analysis conducted by Liu et al.66, they did not reveal a significant connection between IL-6-rs1800795 polymorphism and PCa risk in Caucasian. For other polymorphisms, null association was uncovered when the stratified analyses were conducted based on ethnicity, source of control or HWE status. Although we were surprised by these negative results, the high quality of these included studies and the substantial amount of data strengthened the possibility that the lack of association was not caused by chance. For those comparisons that did not exhibit a statistically significant association, may be as a result of the characteristics of low-penetrance genes. Moreover, although these polymorphisms assessed were appropriate candidates, they only account for some of the factors, and ignored other factors such as obesity, diet and environment. We summarized the advantages of current work. Firstly, although many meta-analyses provided some clues for separate polymorphisms in one or more genes of PI3K/Akt pathway and PCa risk, the current one provide a more comprehensive accurate assessment of the associations of all available polymorphisms in genes of PI3K/Akt pathway with PCa risk. To the best of our knowledge, this is the first pooled study that analyzed the associations between 13 polymorphisms in six pivotal genes of PI3K/Akt pathway and PCa risk. Secondly, we applied classic formula to adjust the P-values, which removed most of the marginal or false-positive P-values, making the final pool results more convincing. Thirdly, we found IL-6-rs1800795 polymorphism could be served as a risk prediction marker for Caucasian PCa patients. Our results provided some clues for the future clinical research that polymorphisms in genes of this pathway may not suitable for high-risk prostate cancer patients' screening. There are also several deficiencies that should be addressed. Firstly, other factors such as the density of prostate-specific antigen (PSA), living conditions and histological types, the stage and grades of PCa should be included to get more precise results. Secondly, for many polymorphisms of these inclusive genes, relatively small samples were included for the assessment, such as rs1927914 polymorphism. Finally, we ignored that there were many individual characters such as age, obesity, alcohol, consumption and other lifestyle risk factors which could influence our conclusions. Overall, our meta-analysis provided no statistically significant association between the 13 polymorphisms in six genes of PI3K/Akt signaling pathway and PCa risk. However, a significantly increased risk of PCa in Caucasian individuals was identified for IL-6-rs1800795 polymorphism in the dominant model. Due to the limitations of these included studies, as well as the risk factors we ignored, further well-designed studies with larger samples are warranted to verify our findings. This study was supported by the Natural Science Foundation of Guangdong Province, China (2017A030313800). W.X., M.Z., J.M. and Z.N. designed the studies and drafted the manuscript. M.Z. and Z.N. performed the statistical analysis. L.Z., S.W. and C.L. managed the experimental design, reviewed the manuscript. All authors read and approved the final manuscript.